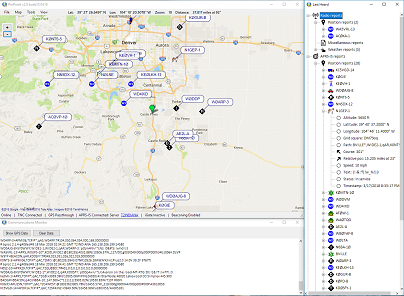 PinPoint offers a modern APRS solution with some of the best and unique features available in APRS software and it has been tested by a number of Amateur Radio Emergency Services (ARES) volunteers that use Pinpoint during exercises and emergencies. PinPoint is completely free for individual use. PinPoint has many unique features that are not found in any other APRS implementation and yet is very easy to use. All features are easily accessible using configuration screens, menu selections or mouse clicks on a map. PinPoint is free software that allows you to visually track and communicate with people using Amateur Radio (”Ham Radio”) equipment. During an emergency, it can be used as a location aware tactical communications tool. It is mostly used as a tool for tracking people and assets on a map, although it is capable of so much more. During, for instance, a weather spotting event, an incident commander could visually track where spotters are deployed in the field, and direct them away from approaching weather using an area map on a computer screen. Pinpoint was featured in the September 2018 issue of ARRL QST magazine. For a comprehensive overview of what APRS is capable of, take a look at the WikiPedia page. For a quick screenshot to see what PinPoint looks like in action, click here. PinPoint does not require an Internet connection to operate (after you have cached all the maps and zoom levels you need) and is self contained. Many people use PinPoint in their car, out in the field or in their home. Click the Download button to go to the download page. PinPoint itself is free software, but a donation is always appreciated. Depending on your needs, you may need radio equipment and related accessories to make it all work, not to mention the fact that you will need to have a valid FCC license (or the equivalent for your country if you are located outside the USA) for the frequency you intend to use. PinPoint is a labor of love by Frank Watervoort, AB0WV and is still under active development, so all the bugs may not have been worked out. If you have a great idea for a feature or are running into problems that are specific to PinPoint (after you have exhausted the enclosed Quick Start guide), feel free to send an email to ab0wv at arrl.net. If enough people suggest the feature you have in mind, it will be added to the product roadmap for PinPoint. PinPoint has built-in mapping and supports quite a few different map providers, including Google maps, Bing maps, Yahoo maps, OpenStreetMaps, including satellite and hybrid imagery. PinPoint caches all map tiles that are requested from a map provider to ensure tile servers are not over burdened and allowing for offline use. Once maps are cached, PinPoint can be taken offline, so it's perfect for use in rural areas where Internet access is unavailable. At the same time, PinPoint supports (RX only) iGate and APRS-IS operation while connected to the Internet.